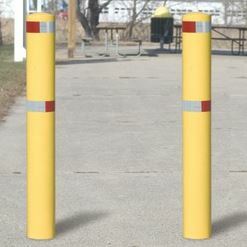 Control or deter traffic with this imposing Bollard Post Barricade. Fabricated using 4-1/2” OD x 10 ga. wall steel pipe. Post stands 41-3/8" tall after installation. Model TB-2 provides standard post to be embedded into concrete footing. Post is open at bottom so you can fill it with concrete before embedment if desired. Reflective decals are included. Model TB/P-2 offers bolt down surface installation with welded on 3/8” thick x 10” sq. steel base plate. A 3" dia. hole in this plate allows you to fill post with concrete before installation. Includes set of four 1/2” x 5” concrete screw anchors. Reflective decals are included. FINISH: Standard finish is high visibility yellow powder coat paint. Or choose powder coat paint finish in your choice of color.